Label applicator machine? This is one piece of machinery that is a must if you want to take your business to the next level. Regardless of the sort of goods you make, package and/ or sell, it is essential that they look professional. The type of labelling you employ plays a vital role in this. Hard to read, crooked or missing labels do not convey professionalism or care, nor do they inspire trust. Handwritten labels, while they give a personal touch, lack consistency and are time-consuming to create. Automating the whole process with professional labellers is the way forward for many businesses. There are many ways to create labels for products, and the one that is right for your company depends on the type and size of your business. A kitchen-based business creating handmade scented soaps and candles has a different target market and a different requirements to a large pharmaceutical company. However, in both cases, it is important that the labelling is clear and consistent; reflects the brand; and contains all relevant information. This is why a label applicator machine is better than creating labels by hand. With an automated or semi automatic label applicator you can produce a label that still reflects who you are and the customers you are appealing to, but you can do this in a much more professional way. Different typesets can still be used to reflect the personal approach that businesses desire, while ensuring that the printed information is readable, fits correctly on the label and is consistent across the entire range. Labellers can create different shapes and sizes of labels that are designed to specifically fit the type of packaging that they will be affixed to. This means that you can still have round, oval or even star-shaped labels that reflect the product. Time is another factor when it comes to creating labels. Doing the whole process by hand is extremely time-consuming. Automating at least part of the process with a semi automatic labelling machine saves you time, and therefore saves you money. How much of the process you automate depends on a number of factors, including the initial amount you have to invest in a machine, the space you have to place your machine and your packaging process. For companies that create large runs of products and have a quick turnover, a fully automatic label applicator is a must. Full automation means that you can design the label you need; set the machine to create the label; and include it within your production line so that labels are printed and applied without any additional input from you. Such machines can be easily adjusted between different lines of products. Most also still give you flexibility in terms of the size of labels you produce, the type of text that is included and the shape and size of the items being labelled. However, it is important to know the scope of your production line prior to buying your auto label applicator. If your focus is on flat-pack cartons, then a machine that is designed for wrap-around labels is not going to meet your needs. 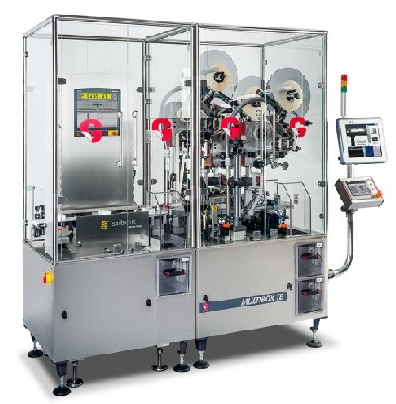 Similarly, if you produce small bottles and vials, a wrap-around labelling machine is going to be perfect. If you are going to integrate the labelling machine into your existing production line, you also need to think about ease of access to replace consumables such as thermal ribbons or foils. Also consider how disruptive its placement will be if you need to service the machine or conduct repairs. Types of the label applicator machine varies in size and complexity, and not all of them require you to make major changes to fit them into your existing set up. Careful consideration of all aspects is important before you complete your purchase. When Should You Consider A Manual Label Applicator? Fully automated systems are not for everyone. There are occasions when a manual label applicator is better for your set up. This may be the case if you have smaller production runs or change the type of product regularly. However, before deciding whether a manual approach is better for your needs, you need to consider whether it is cost- and time-effective. You could find that even with smaller runs, a semi-automatic or fully automatic system is more time-efficient. Knowing what system is best for you is not always easy, and this is why it is important to use a labelling supply company that has knowledge and experience of selling and setting up a wide range of labelling machines. They will be able to provide you with advice on the system that is best for you and then provide ongoing support as it is required. When searching for such a company, look for one that asks you about your products, your business setup and your time and space needs. If they show no interest in finding out about these elements, then the machine they sell you is highly unlikely to be fit for purpose. Another consideration when searching for the right company to provide your manual label applicator machine is to consider one that also sells the consumables you need to keep your machines running. While it is not essential to buy these from the same company, it does ensure that everything is compatible and that potential problems are more easily traced back to their source. Whether you are looking for a fully automated system or semi-automated one, the team at Sessions UK are here to help you make the right choice. Our knowledgeable and experienced staff take the time to get to know your business and your labelling needs before recommending any of our machines, whether that’s the label applicator machine or otherwise. Our customers also benefit from our machine hire and second-hand machines for sale, as well as our dedicated servicing and repairs service. Talk to one of the team today on 01904 610613, or visit us at https://sessionsuk.com to find out more.